On April 22nd, 2009, the Government of Ontario ARBITRARILY IMPOSED RECKLESS AND MALICIOUS PROHIBITION against pest control products used in the Urban Landscape. As Minister of Health and Deputy Premier, George Smitherman was a PRINCIPAL ARCHITECT in the CONSPIRACY TO PROHIBIT pest control products DESPERATELY NEEDED by the Modern Professional Lawn Care Industry. Since being CAST OUT of politics, unfortunate harm has been inflicted upon Smitherman and his family. With no ill will intended upon Smitherman, it is difficult for observers to express the slightest bit of sympathy for him. PROHIBITION INFLICTED CATASTROPHIC BUSINESS CARNAGE. 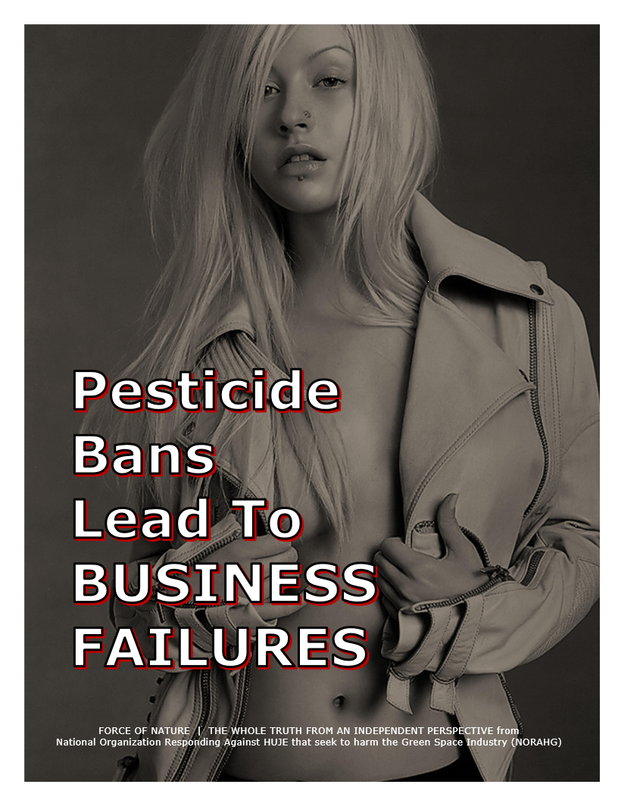 Because of Smitherman′s SUPPORT of Ontario’s 2009 PROVINCIAL ANTI-PESTICIDE PROHIBITION, businesses operating in the Professional Lawn Care Industry were DESTROYED. Because of Smitherman′s SUPPORT of PROHIBITION, the owners, employees, and families dependent on Professional Lawn Care businesses faced TERROR, DESPAIR, and DESTITUTION. PROHIBITION DESTROYED their businesses, their assets, their customers, their homes, their lifestyles, their job security, their families, their children, their loved-ones, and their futures. Ontario’s 2009 PROVINCIAL ANTI-PESTICIDE PROHIBITION HURLED them all into SQUALOR and DESPAIR, forcing them to BURN-IN-HELL. From 1999 to 2009, George Smitherman operated as an Elected Official in the Government of Ontario who REPRESENTED THE VESTED INTERESTS of Anti-Pesticide and Environmental-Terrorist Organizations. Smitherman DID NOTHING PROTECT THE INTERESTS OF DECENT, HARD-WORKING, AND TAX-PAYING PEOPLE dependent on the Professional Lawn Care Industry. Elected Government Official like Smitherman are supposed to represent the interests of ALL people, and not just those of Anti-Pesticide and Environmental Terrorists ! Smitherman VOTED IN FAVOUR OF RECKLESS ANTI-PESTICIDE PROHIBITION that EXTENSIVELY DAMAGED AND DESTROYED businesses operating in the Professional Lawn Care Industry. Because in large part to Smitherman’s CALLOUS AND RECKLESS SUPPORT OF PROHIBITION as an Elected Government Official, Ontario’s 2009 PROVINCIAL PROHIBITION led to LOSS OF REVENUES, BUSINESS FAILURES, BANKRUPTCY, and UNEMPLOYMENT. 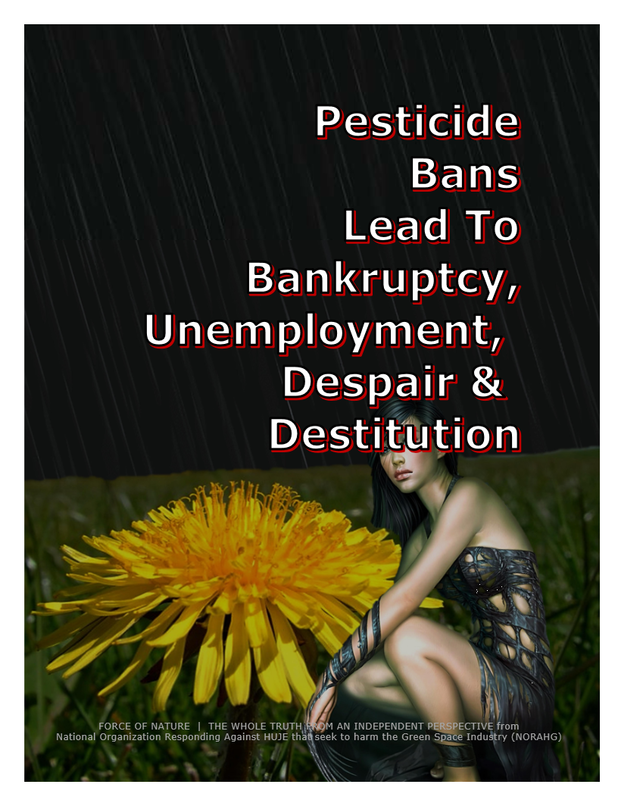 Ontario’s 2009 PROVINCIAL ANTI-PESTICIDE PROHIBITION INFLICTED TERROR, DESPAIR, and DESTITUTION on THOUSANDS of hapless victims throughout the Professional Lawn Care Industry. Because of PROHIBITION, Professional Lawn Care businesses were forced to TERMINATE many or most of their employees. The CATASTROPHIC BUSINESS CARNAGE of the Professional Lawn Care Industry was EXTENSIVE because there were NO valid economical alternatives to replace the prohibited products. Consequently, Professional Lawn Care Companies were UNABLE to provide adequate weed and insect control, and were UNABLE to keep their customers satisfied. The Ontario Professional Lawn Care Industry LOST OVER 500,000,000 DOLLARS, with UP TO 12,500 UNEMPLOYED. 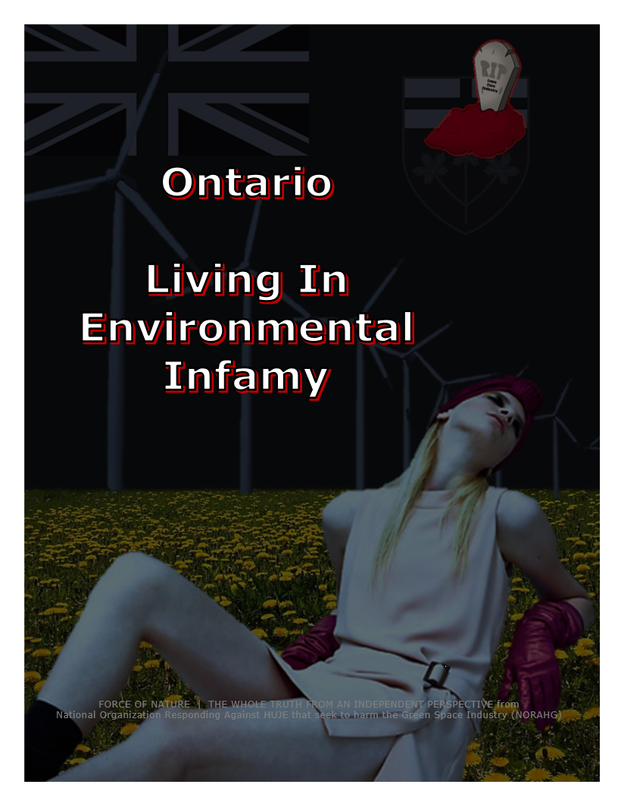 Moreover, because of PROHIBITION, Ontario Green Spaces became OVER-RUN WITH WEEDS, INFESTED WITH INSECTS, and DISMALLY DESTROYED ― they looked like GARBAGE DUMPS. CATASTROPHIC BUSINESS CARNAGE was, in large part, due to Smitherman’s SUPPORT OF THE VESTED INTERESTS of Anti-Pesticide and Environmental-Terrorist Organizations. Smitherman and other Elected Government Officials KNEW FULL WELL THAT IN ALL CASES, PROHIBITION WOULD LEAD TO BANKRUPTCY, UNEMPLOYMENT, DESPAIR, and DESTITUTION. They were WARNED that their actions would lead to CATASTROPHIC BUSINESS CARNAGE ( a.k.a. SUN-SETTING ). Smitherman and other Elected Government Officials were OFFICIALLY WARNED about the CATASTROPHIC BUSINESS CARNAGE or SUN-SETTING that would result from PROHIBITION. Despite the ACCURATE PREDICTIONS by the Ontario Environmental Commissioner regarding the eventual CATASTROPHIC BUSINESS CARNAGE ( a.k.a. 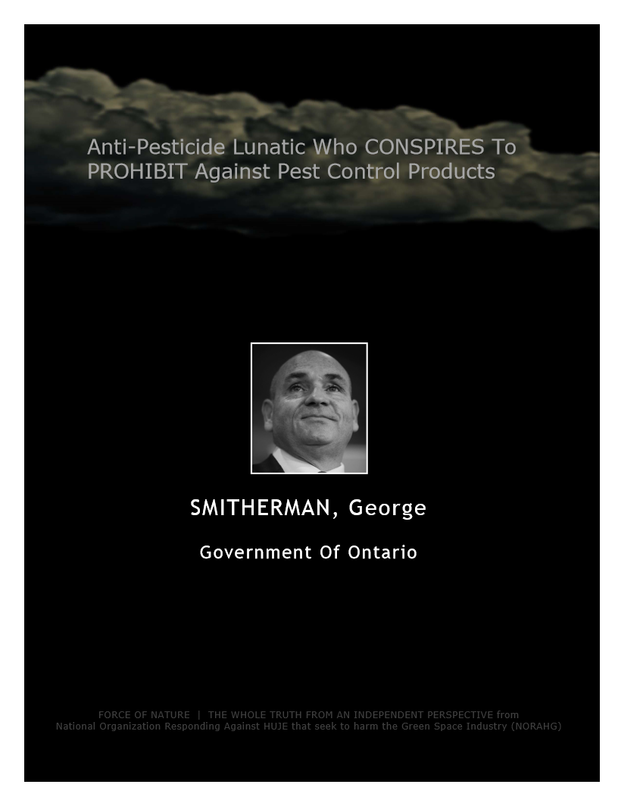 SUN-SETTING ), Smitherman and his colleagues CALLOUSLY AND RECKLESSLY PROCEEDED WITH PROHIBITION against pest control products used in the Urban Landscape. In the short-term, however, the ban may have SIGNIFICANT EFFECTS on the economic health or continued viability of many lawn care businesses, effectively SUN-SETTING components of an industry. Again, Elected Government Officials like Smitherman are supposed to represent the interests of ALL people, and not just those of Anti-Pesticide and Environmental Terrorists ! Smitherman VOTED IN FAVOUR OF RECKLESS ANTI-PESTICIDE PROHIBITION that was⁄is NOT EVEN SUPPORTED by Ontario home-owners. Ontario home-owners WOULD RATHER HAVE THE BAN SCRAPPED OR MODIFIED. 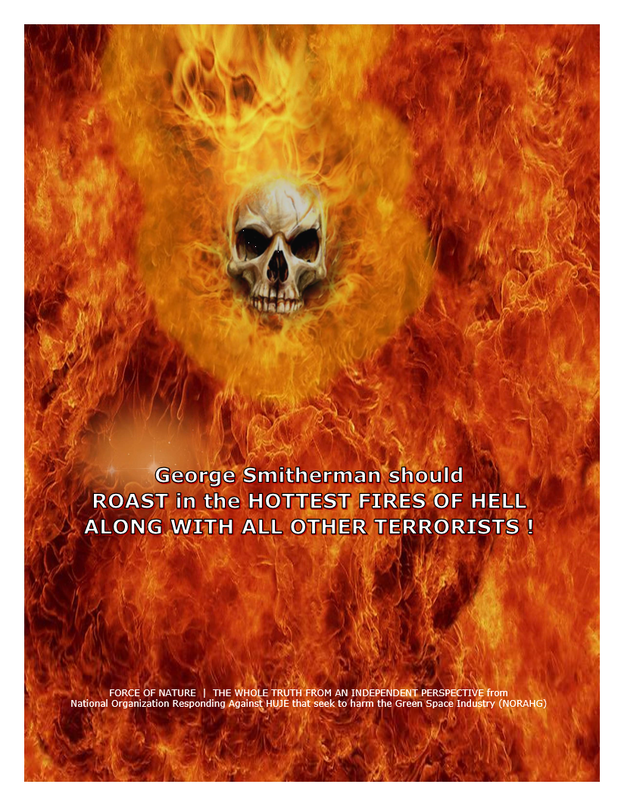 Although no observer has ever wished any personal harm to befall Smitherman and his family, it can be said that observers have hoped that Smitherman ROAST IN HELL FOR ALL ETERNITY FOR HIS ACTS OF ANTI-PESTICIDE SUBVERSION.